There have been rumours of the return of Bionicle in 2015 in a couple of online forums recently. Now, GrooveBricks has posted a image of a display stand which appears to corroborate them. It shows 13 sets, 5 small and 8 larger. I must admit to having a soft spot for Bionicle so I'm glad to see it return. I'm also glad they're keeping the current system, which means my trays upon trays of Hero Factory bones and shells are not redundant. It doesn't necessarily mean Hero Factory is ending either, there's plenty of talk on Eurobricks about it, and the rumoured set numbers for Bionicle don't follow on from the 440xx that Hero Factory had. But that's just what I believe. Bionicle's story was apparently getting too complicated coupled with decreasing sales this meant they needed to end Bionicle. Bionicle was suceeded by Hero Factory which had a more accessible story that was almost non-existent. As for the news, its good to hear but I've known about this for a while their have been pictures of this online for over a month now, with the colour picture being released a day ago via members of TTV. Adding to TheOneVeyronian correction: This picture likely will be in line with the leaked product list earlier, which means: 6 defenders, 6 masters (probably just Toa) and 1 Spider set. Some other sets will also include a tinier spider. YES!!!! BIONICLE!!!! For years Bionicle was one of my favorite themes. I am so glad they are re-releasing it! The one thing that makes Hero Factory inferior in my opinion, is that it lacks the same sort of depth. Very nice to see some of the original designs being used. Tahu was always my favorite. So fun to see he's back! I can't wait for 2015! Oh no! I think they are using parts from hero factory, seriously LEGO? Serious?! Very happy about this return. Loved Bionicle theme as a child and shall be good to see this theme again, never liked Hero Factory. For me, being a Technic fan, Bionicle was a hybrid of a new theme and Technic. 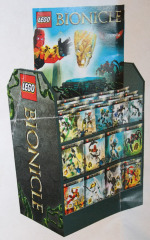 I have wondered whether the success of Bionicle theme during Lego's under performing years was due principally due to fathers holding on to memories of the initial Technical years (late 70's early 80's) and then sharing that experience with their sons during the heyday of Bionicle in the early 2000's. This describes my experience with Lego in the early 2000's and also defines my lighter grey period of the Dark Ages as being actively participating in my son's Bionicle expansion. I hope the new theme allows for more creative builds and not so much one design per set. Lego always re-uses parts... its not surprising at this point. Its also been obvious to many who have seen Hero Factory that Lego has been improving on most the parts. Yeah, the thing I remember about Bionicle was that the general story of the setting/characters was *incomprehensibly* convoluted. After a few years, I gave up trying to make sense of any of it. I didn't mind some of the toys, though. WHAT? WOW. Personally I always liked HF better, but I always preferred new sets to old sets. For someone who doesn't know much about either theme and would only really be interested in any parts that might appear in them rather than the completed models, can someone summarise the difference between them? In BIONICLE's heyday, the building system focused around ball joints and TECHNIC pinholes and axleholes. The various holes were used for attaching armour. In HERO Factory, it's just balls and more balls. A new type of armour was created that snaps onto balls that are usually placed 'inside' of the various skeleton pieces. I missed the whole Bionicle thing back in the day. I am kinda interested in it though because people really seem to care about it. I just wonder how creative you can get with the parts. Lego for me always has been about building my own things. Wow, this must mean Hero Factory will be discontinued this year. I never thought Bionicle would be back, but I secretly hoped it would! I hope they did a good job! I really hope HF continues alongside this. I've always preferred actual robots to robots masquerading as organic beings, but I'm thrilled (and unsurprised) to see CCBS stay in fashion. Front on Eurobricks, who works for LEGO, confirmed that CCBS isn't going anywhere. I want a good storyline with this, but not something as convoluted and thick as the original. Just a confirmation: The "Lord of Skull Spiders" is not the only villain of the wave. There's a small "Skull Spider" included with each of the Toa, ala Invasion From Below. I'm definitely excited! The sets look great as far as I can tell (and I'm SOOOO glad they use the CCBS)! Not as diverse as this year's Hero Factory sets, but then again, that's basically to be expected when you switch from sets depicting monsters and battle machines to sets depicting humanoid characters. It is still confusing why LEGO ended BIONICLE in 2010.Unlike HF,BIONICLE has a much better storyline with a lot many characters.I hope this time it will be a reboot.It's hard for me to know a complete privious storyline. YAHOOO!!!!!!!!!!!!!!!! YIPPEEEEEEEEEE!!!!!!!! YESYESYESYESYESYES!!!!! I LOVE BIONICLE, LOVE IT, ITS A MIRACLE!!!!!!!!!! Yes, glad they are coming back they must appear on the next Lego Movie). The Defender sets look to be about the size of 2.0 Heroes, whereas the Toa look to be the size of titan sets. I hope the Toa won't be too expensive. I want to try and pick up at least one Toa, one Defender, and the Lord of Skull Spiders. Ah yes, Bionicle, the grand pinnacle of my childhood. Will I get any of the sets? Probably not, I've moved on from buying LEGOs and just create MOCs, but it's great to see it back. I'm also glad to see the no-story haphazardly thrown together idiotic HERO factory getting cancelled (hopefully). Bionicle has a real story, real mythology, and real characters. Oh, hello 13 year-old me, where have you been?! @krollins: I personally expect the defenders to be $10 and the Toa to be $15. I was kind of hoping that the defenders would be $5 and the Toa $10, but I guess this is more consistent with what the LEGO Group has found sells best in the constraction category. At this point there's pretty much no way this image is a hoax. The first leaked version of this image (smaller, and in black and white) appeared early in the month, but in this larger image you can see that the defenders use the new rapid-fire blasters from #75084 Wookiee Gunship. If this image was fabricated, how would it show a piece from multiple angles that hadn't even been seen in a set before this week? I'm going to be a bit sad if Hero Factory ends. It brought us some great sets and a very fun universe to play in. And it would be fantastic if Hero Factory could continue at minifigure scale, as it has been this past year, focusing on creative and diverse battle machines instead of full-size humanoid figures. I love the constraction category as a whole and would be thrilled to see it expand. With that said, given the size of this initial wave (13 sets! Wow! ), it's unlikely that Hero Factory will be continuing alongside it. I wonder how long before the "Brickset effect" strikes? Well I'm happy to see that the rumors were true! Hero Factory devolved from Bionicle. There are way too many new molds as ball and socket pieces, and I really hate how lego does that. They use to be technic, and now..........well, they crossed the line with the tird or so line of hero factory. We need more sets like Witch Doctor. Friends, I cannot tell you how long we have been waiting for this moment. Five years couldn't have come soon enough. Get ready for a new journey. That is the way... of the BIONICLE. ... I'm not really sure where to go from there, this means a whole host of good things. Bionicle's great story will be coming back, hopefully with a few new books (I'm pretty sure I've read all of the original Greg Farshety Bionicle novels, which, by the way, are great reads). We'll be seeing the return of classic characters... By the way, is this the first time LEGO has brought a theme back from the dead? In any case, I'm very excited. Here's hoping the action figures fulfill our expectations. @Aegis2000: I'd say it evolved, not devolved. And to be honest, one of the best things about the HF building system is that it set up a system that could be used for years and years right off the bat, instead of introducing so many new and specialized parts every year for a shallow sense of variety, as BIONICLE so often did. My fist set was a BIONICLE, and from ages 7-11 I was captivated with the strong storyline and the powerful sets. I hated Hero Factory and cannot wait for 2015! Well, this is great. Though Hero Factory did introduce a new aspect of building, its simplicity and childish story made it a much weaker product than BIONICLE. BIONICLE introduced a more complex and realistic plot, as well as containing characters that are quite original and intimidating. And rather than bringing a new villain every six months, BIONICLE had a way of keeping Teridax an imposing threat and the main villain all the way through. Unfortunately, the sets seem to be too much like Hero Factory in build, but we'll know for sure when we get the official images. I wonder if they're going to bring back BionicleStory.com? Zman: indeed, well this is the best news i've heard in a long time for Lego. And interestingly enough when I searched for more info going by the set names, the original six Toa are back except for Kopaka oddly. At long last they have returned! It's hard to believe it's been almost five years since my favorite theme was discontinued. By now, I was beginning to lose hope that it would ever come back. I thought it had gone the way of Exo-Force, or Knight's Kingdom 2 before it. Finally, though, Lego has decided to bring back their most engaging and expansive (story-wise, at least) theme ever. Thank goodness. I hope the sets and the story are as good as they were pre-2010. Let's hope Greg Farshtey writes the story again, too. i was just looking at my Bionicle bucket, and rebuilt my collection, i was actually on Ebay recently so i could collect the sets i did'nt have ;) so its pretty cool the sets are back. #dreamscometrue #yay #whydoyoutakeallmymoneyLego??? ^^ ITS A DREAM COME TRUE!!!!!!!!!!! Changing your comment doesn't change the fact you were originally complaining about it, which as I said is a little silly because Lego re-uses parts all the time. All in all, very cool. @MrCubbieBlue: Well, besides Space Police, Alpha Team basically ended in 2002 only to be brought back in 2004 (there was a single polybag set in 2003, but I hardly think that counts as the theme continuing non-stop). And Adventurers ended its original three-year run after Dino Island in 2000 only to be brought back as Orient Expedition in 2003. Pirates also went on a lengthy hiatus in the late 90s and early naughts, though it's a special case since the LEGO Group considers it an evergreen theme. And if you want to count licensed themes, there was at least a three-year gap between the last LEGO Batman sets in 2008 and the first LEGO Super Heroes sets in 2012. But yeah, it's a rare and special occurrence, to be sure. Especially since BIONICLE is so much more story-driven than most of those other examples. @Legozebra: I don't see why you feel that way. If the core mythology is intact, then the continuity doesn't necessarily have to be maintained. Nor do some of the theme's more annoying story decisions, like having elements strictly divided up by gender. With that said, I AM curious how they're going to handle this. They can't just start fresh from the beginning — there's no way the secret of Mata Nui's true nature could be maintained, with the Internet being what it is. And yet, at the same time, the Great Spirit Mata Nui is perhaps the central concept that drove the entire storyline from the beginning. As you say, losing that component (or twisting it into something different) would mean losing a lot of what made BIONICLE what it was. @Legozebra, agreed. As long as they stay close to the original theme and story, I'll be satisfied. Also, I hope the gold mask on the box is NOT that of Makuta Teridax. His original one was terrific. In terms of story, I'd like to either see something set far in the future (or even in the past), or a complete reboot. At first I thought similarly to what Legozebra did, but I'd like to see what they can do with the style/essence of Bionicle (in contrast with something like Hero Factory) while being given the freedom to do (almost) whatever they want story-wise. I think the closest comparison would be Lego Space and it's sub themes disappearing for several years with the introduction of Star Wars, before returning with new life in Mars Mission. In my opinion the Bionicle story line kept getting better and better. 2006 is where it really hit it's stride. I only wonder whether GregF will be returning as story director. BIONICLE IS BACK AND I AM SO EXCITED!!! Even though ive known about this for like a month but this is a full color picture which ive never seen before, welcome back my favorite theme!!!! - good guy team vs bad guy and team. The story was simplistic and arguably very basic, only complexity came from the names of the sets and the expanded material that was not necessary to know. Each year you were told who the good guy and bad guys were and each year they had a quest normally involving finding a mask. I guess what I was trying to say was that I was hoping they wouldn't just do away with the entire old storyline and start a completely new one (i.e. make the original mythology non-canon). To me, retaining just the character names and basic mask collectability does not make it Bionicle if the story is different. @Legozebra - Look at superhero universes. Every few years, long-time characters like Batman are reinvented and it works just fine for them. Bionicle's storyline was so convoluted that, even though I had practically all of it memorized, I would be glad to see it refreshed. Honestly, the planet-sized robots were too much. And here's some more early concept art: http://faberfiles.blogspot.com/2012/04/first-view-of-mata-nui.html (perhaps helping to understand why the name "Mata Nui" literally means "great face" in real life, and why most of the place names on Mata Nui are likewise real Polynesian words for facial features). It was a well-kept secret, but nevertheless, it was hardly some extra, unnecessary complication that was added in BIONICLE's later years. And @Legozebra, your childhood nostalgia wouldn't be non-canon. It'd just be canon to the previous continuity rather than the new one. I hate this. The images show the Bionicles made out of HF parts, which is not Bionicle. Overall, LEGO finally put Bionicle back, and they did it horribly. @Coson: The original BIONICLE sets used a lot of Slizer/Throwbots and Roboriders parts, so your point is moot. And the CCBS was never designed to be used for JUST Hero Factory. It's a much better building system than BIONICLE's old one anyway, as far as I'm concerned. If it's good enough for BIONICLE's lead set designer (who happens to be one of its inventors), then it's good enough for me. I'm very excited about this news. Especially about the continued usage of the CCBS. The possibilities are blossoming.